This page details the diary of our trip to Alaska, USA with a short hop into the Yukon, Canada, this June & July 2018. To sum up our trip – what an truly amazing place and we can’t wait to go back. This time we flew from Manchester to Seattle, a now familiar airport having flown into Seattle last year when we toured the Pacific Northwest USA. We then took an Alaska Airlines flight from Seattle to Anchorage – what a fantastic airline, very comfortable, modern and extremely friendly staff. We spent a couple of nights in Anchorage, exploring and stocking up on essentials, including bear spray, then we headed north on the Alaska Parks Highway to Denali National Park calling by Flat Top Mountain, Eagle River, Eklutna Lake and Talkeetna. 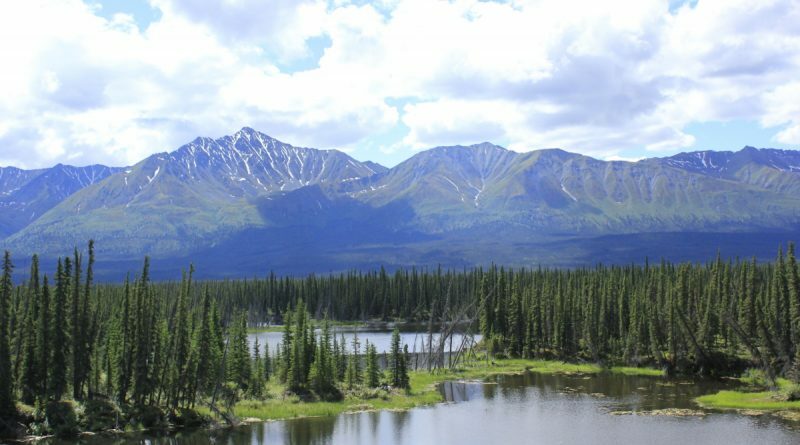 After a couple of nights in the Denali National park area we headed to Fairbanks and round onto the Alaska Highway through the North Pole, Delta junction and to and overnight stop in Tok. We then journeyed into Canada and the Yukon to Haines Junction for the night. From here we looped down to Haines caught the State of Alaska Marine Highway Ferry from Haines to Skagway where we had a touristy stop for the night along with several cruise ships! The next morning it was north via Carcross and the Carcross desert, Whitehorse, back through Haines Junction and onto Destruction Bay for a late night stopover. We then said goodbye to another short trip into Canada and carried on our route to Glenallen and onto Copper Centre for the night in preparation for driving down the Richardson Highway to Valdez. After an early start we headed south to Valdez over the spectacular Thompson Pass. We over-nighted in Valdez then boarded another State of Alaska Marine Highway Ferry from Valdez to Whittier. This ferry took approximately 6 hours, and at the time of planning we were torn between the ferry and driving around on the Glenn Highway to Seward. In the end we’d opted for the ferry and it was the right decision. We had the most amazing weather, clear blue skies and calm seas gave us fantastic views of the Columbia Glacier along with several views of whales and dozens of puffins and sea otters. We were extremely lucky. From here we travelled on the Seward highway to Seward for the 4th July celebrations – amazing. Fireworks, street parades and the Mount Marathon Race alongside perfect weather and roasted corn cobs! On leaving Seward we did some fantastic hikes at the Exit Glacier so much so we ended up there until mid-afternoon. So it was a quick drive over to Soldotna which was our base for a couple of nights to explore the area. We took a jaunt down the Skilak Lake Road and a day trip down the Sterling Highway to Homer and back. With clear views of the volcanoes and surrounding mountains we were really having amazing luck with the weather. After some very tasty fish and chips and then ice cream in Homer we had another night in Soldotna then prepared to head north to Anchorage. On our last full day we attempted to visit Girdwood but came across the Annual Girdwood Forest Fair. This unfortunately was creating miles of tailbacks to Anchorage and solid queues of traffic into the town so we decided to give it a miss – added it to our list for next time! We headed north around Turnagain Arm stopping off at many of the viewpoints and onto Potters Marsh for some moose spotting. We then did a quick jaunt into Anchorage to visit the Anchorage Market, another walk down to Ship Creek then a final visit to Walmart to stock up on Milk Duds and a few cheap holiday presies! That night we chose to be by the airport as our flight was very early, but we happened to be across the road from the Lake Hood Seaplane base so we had an enjoyable evening walk around the lake. After leaving our (thankfully unused!) bear spray at the hotel reception – they put them aside for anyone enquiring about some(!) we headed to the airport for our return flight to Seattle and then onto Manchester. This trip we covered just over 2,800 miles in 2.5 weeks. We viewed both the Alaska Railroad train and the White Pass & Yukon Route Railway trains. The scenery throughout out trip was just amazing as was the wildlife. We watched countless golden and bald eagles, puffins, sea otters, owls, moose, black, brown and grizzly bears, a coyote and a Lynx! What a truly amazing trip it was – we can’t wait to go back.